Readers of Under the Hollywood Sign will recall previous posts about the tree rats that populate the Hollywood Hills and the coyotes that (mercifully) cull them. 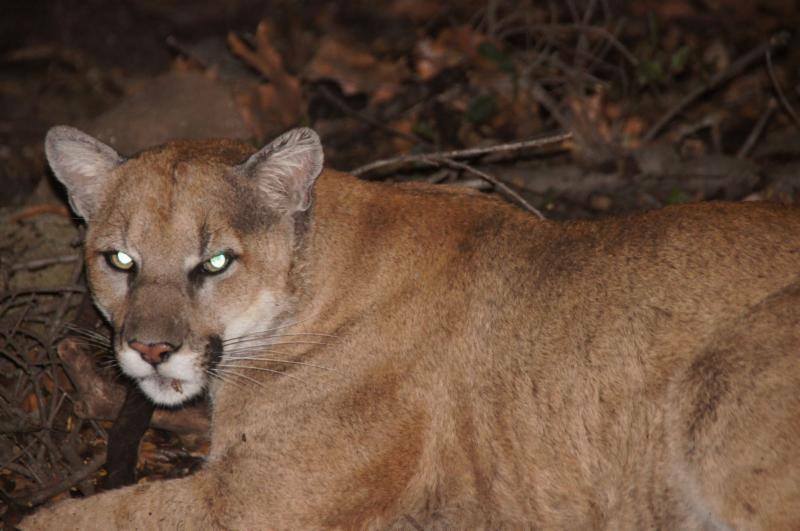 Sadly, the poison that residents sometimes resort to using when rats invade their homes has moved up the food chain, poisoning coyotes and the mountain lions that feed on them. 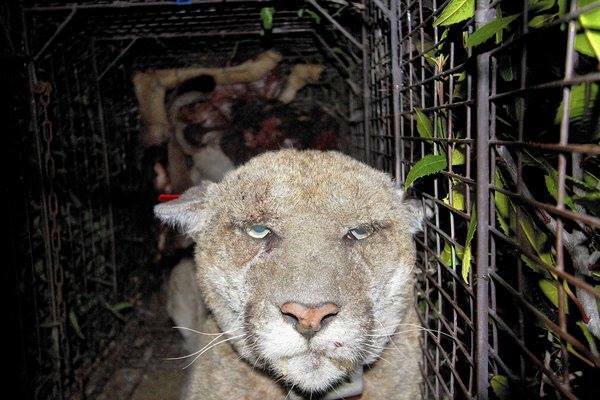 This point was underscored by the revelation that P22, the mountain lion whose nighttime meanderings through Hollywoodland have lately been captured on camera, has been sickened by raticide-related mange. The good news is that the house has just been sold. 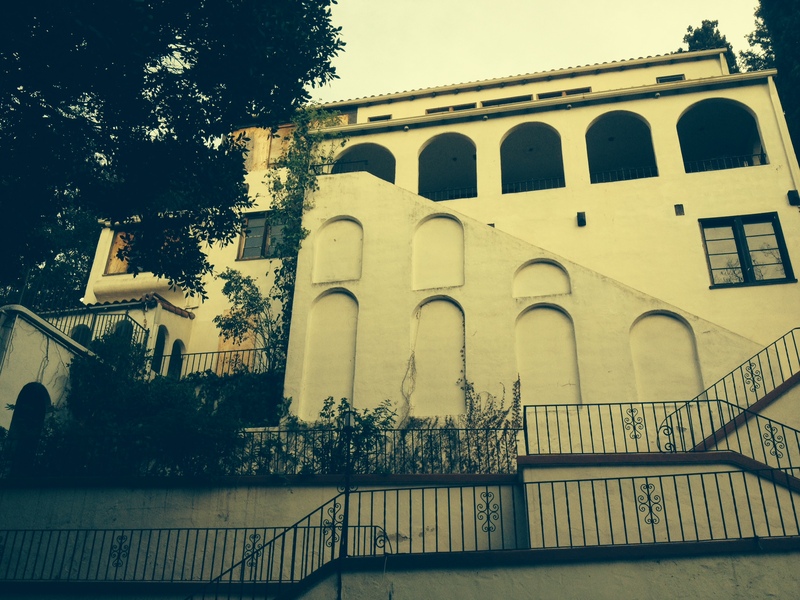 Let’s hope the new owner will drain the pool before tackling what promises to be a lengthy and arduous renovation. 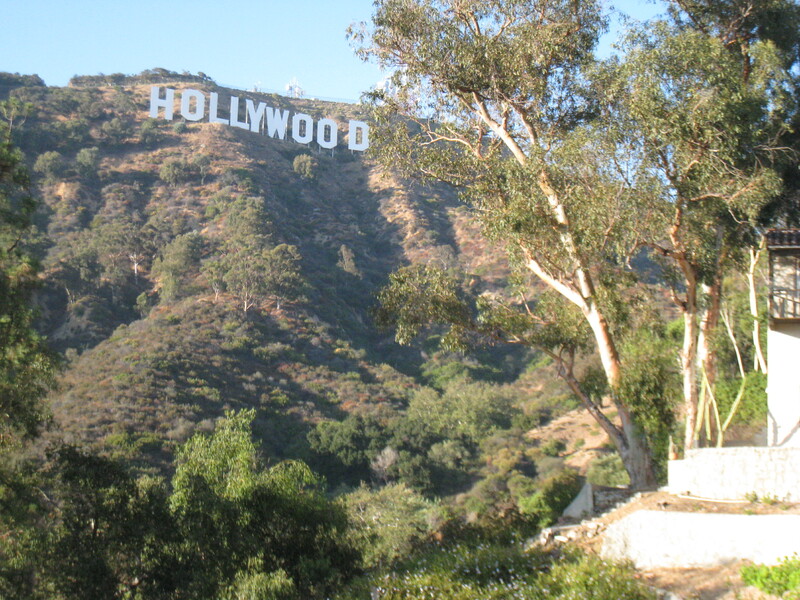 Tuesday night’s meeting of the Hollywood Homeowners Association began with the reading of a motion stating that the “Hollywood Sign Scenic View” signs would be taken down; as of tonight, all but one have been removed. Because of that decision, the discourse that followed was civil, with most speakers agreeing that directing tourist traffic from one area of Hollywoodland to another has done nothing to solve the problems caused by too many cars on the narrow, winding streets below the Hollywood Sign. Beyond the fact that residents of those streets repeatedly have been trapped by total gridlock, tourist traffic has blocked emergency vehicles from the upper Canyon. This includes the service road leading to the ranger station above the Sign–the only means of getting fire trucks to a large swath of Griffith Park. If gridlock were to continue, those living on the affected streets would be on their own in the case of a medical emergency or fire, an untenable situation. 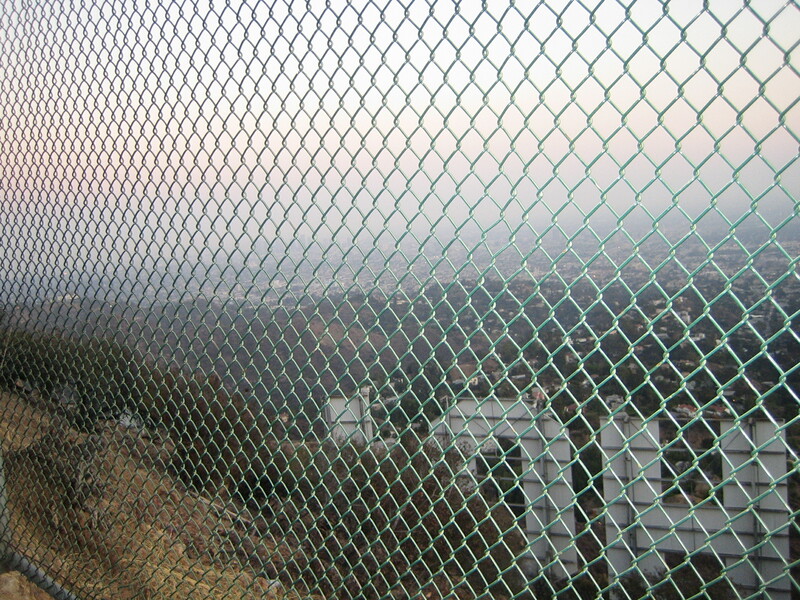 What lies ahead for Hollywoodland residents is more study of the traffic problem and hard choices about its abatement. Meanwhile, there’s summer to think about, with its perfect storm of high season tourism and fire hazard. The fact that many tourists think nothing of smoking in the vicinity of the Hollywood Sign, a clear violation of posted signs in an area of dry chaparral, only adds to the danger. Even unlit, the Hollywood Sign can be seen at night from Hollywoodland, the neighborhood that is its home. The Sign’s whiteness reflects light, whether natural (from the moon) or electric (from the ranger station and communications tower above it). At times it glows, an alabaster sculpture against the dark chaparral. For those who live near it, the Sign is visible day and night, except on those rare rainy days when it’s shrouded in fog. When I moved to Beachwood five years ago, the Sign was being repainted, and its renewed whiteness struck me as an omen for my new life. 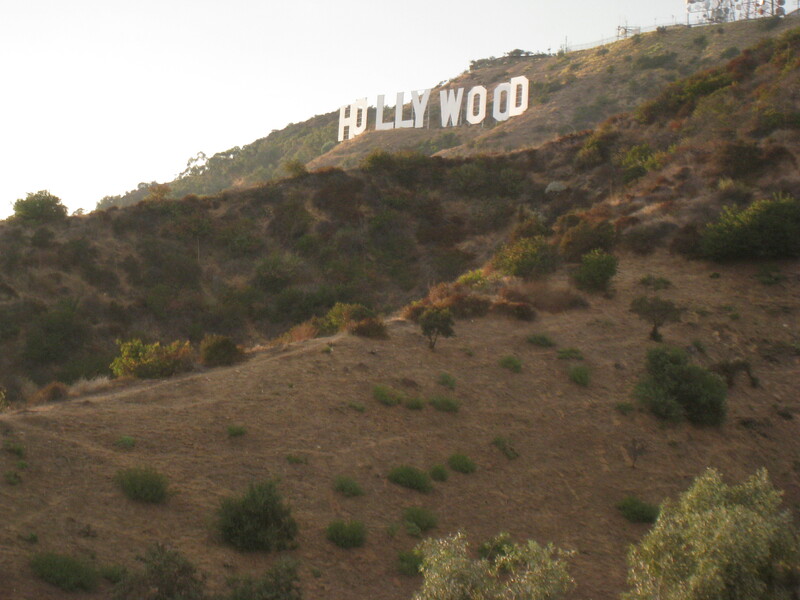 On one of my first nights in my house, I was amused to hear a child yelling, “Hello, Hollywood Sign!” outside. As I soon learned, the Sign affects adults in much the same way: they want to know it, and knowledge demands proximity. Hollywoodlanders who live high in the Canyon report a steady stream of nighttime visitors, particularly in summer. The Sign’s inaccessiblity–it is fenced from the back and heavily alarmed–dissuades few from getting as close as possible, even if it means going on foot, either legally, up the steep fire road, or illegally, to its front. I like to hike up the fire road with my dog in the late afternoon. It takes us about an hour to make the round trip, and in winter we sometimes have to hurry against nightfall. The road cuts through parkland and gets dark very quickly after sunset; there are coyotes, bobcats and mountain lions in the area. Yet I’ve never not passed someone going up as I was making my way down. 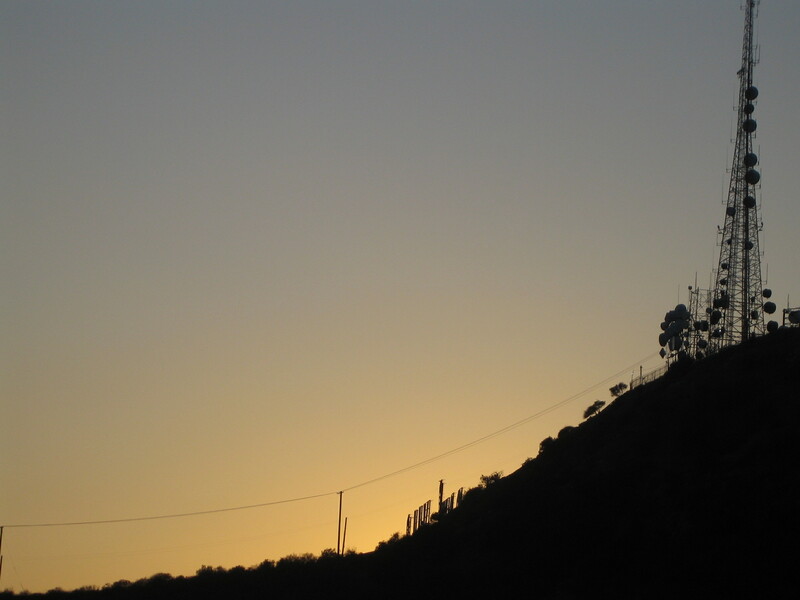 Early in 2007, Tjardus Greidanus, the DP on my documentary, “Under the Hollywood Sign,” was shooting b-roll before dawn when he saw a man heading up toward the Sign, a bottle of wine in hand. There was no doubt of the man’s intent: a libational greeting of the new day, at the epicenter of new beginnings. On Monday at 12:15pm, the temperature in downtown Los Angeles reached 113 degrees, the highest of any day since record-keeping began in 1877. Here in Beachwood, always slightly cooler because of its higher elevation, the temperature reached 110. In my house, the air conditioner was unable to cool the upstairs below 91 degrees; downstairs, where I work, the atmosphere was somewhat better, around 85 degrees. Though I kept my dog and bird indoors rather than expose them to stroke-inducing heat, I ventured out in my much cooler car to run a few cross-town errands. Traffic was nonexistent due to the temperature, and I got home in record time. As night fell and temperatures dropped to bearable levels, I gave up on air conditioning and threw open the windows. Helicopters circled overhead, and as the evening wore on I began to wonder if a fire had broken out in Griffith Park. Eventually came word that the helicopters were assisting in a search for a lost hiker. Besides thinking it was the worst possible day for hiking, I wasn’t surprised: hiking accidents are an occasional occurrence in the Park. It wasn’t until yesterday morning that I learned the hiker was found dead in a ravine in Bronson Canyon, just east of Beachwood. She was Sally Menke, 56, an editor best known for her work on the films of Quentin Tarantino. Despite the heat, she had begun hiking that morning with her dog and a friend, carrying only 16 ounces of water. When Menke decided to cut the hike short, her friend went on without her. It wasn’t until hours later than anyone realized she was missing. Search-and-rescue teams found Menke’s body just after 2am. Her dog–who miraculously survived–was standing guard. 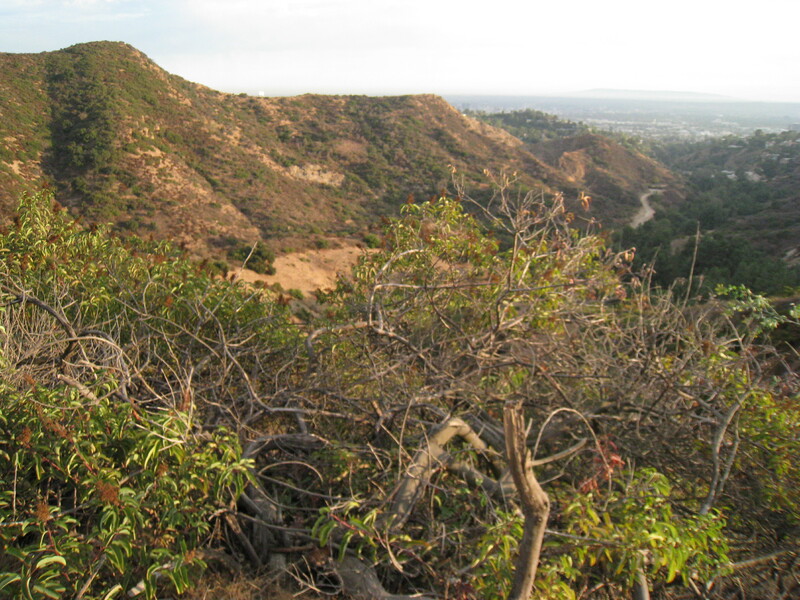 It’s hard to convey the vastness and wildness of Griffith Park to those whose idea of a park is Central Park or some other man-made green zone. Its size–over 4,200 acres–not only makes it the largest municipal park in the United States but gives it more in common with a county or state park. As the Park’s website makes clear, it is largely wilderness and contains not only deer and coyotes but bobcats and mountain lions. Its 52 miles of trails are a huge civic resource, allowing residents to enter the natural world without leaving the city. Nevertheless, hikers often underestimate the trails’ dramatically varied elevations and levels of difficulty. 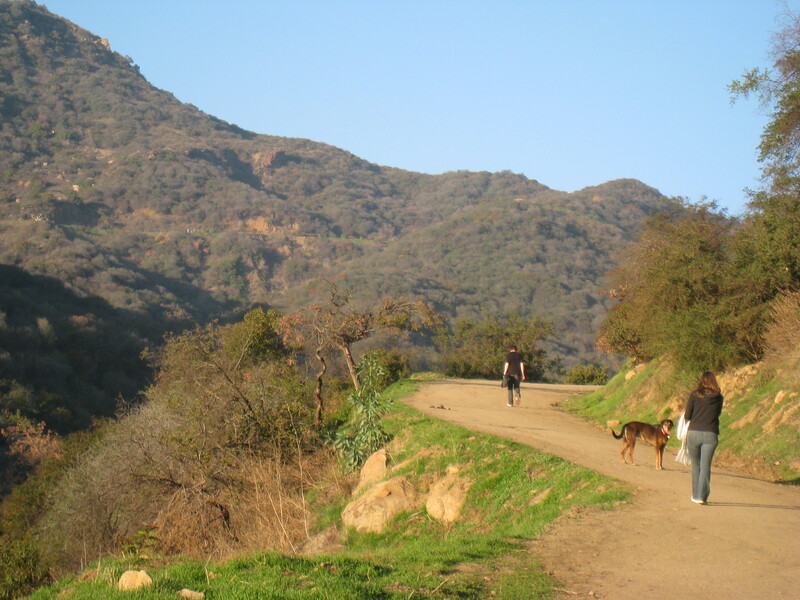 In Bronson Canyon, the trail begins easily but becomes increasingly steep and narrow as hikers approach the Hollywood Sign. This isn’t the first time someone has gotten into trouble there. A couple of years ago, helicopters were called in for a pair of hikers, one of whom was injured and needed rescue. In the wake of this tragedy, one can only hope that hikers will take better precautions in Griffith Park, carrying adequate water and knowing their limits. I know all too well the urge to go hiking on the spur of the moment: because the trails are close by and hiking is commonplace, it’s hard to see it as a risky activity. But everyone, regardless of ability, should understand the dangers of hiking in extreme heat. You are currently browsing entries tagged with Griffith Park at Under the Hollywood Sign.